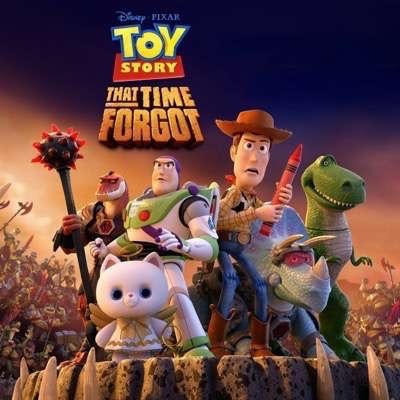 Home / Movie Reviews • Reviews / Toy Story That Time Forgot Blu-ray Review! 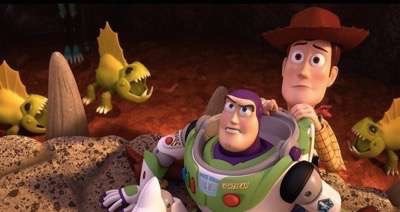 How Does The Newest Adventure With Woody And Buzz Compare To The Classic Trilogy? 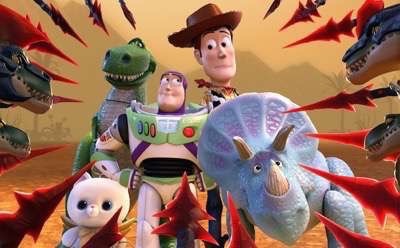 When it comes to modern day animated classics, very few would argue that the gold standard is Toy Story. The trilogy of films has pulled heart strings and made generations look at their toys in a whole new light. I know that Toy Story is one of the first things that comes to mind when I look at my unplayed with toys when visiting my mom’s house. Talk about being a part of the cultural zeitgeist! The gang is back in a brand new adventure that originally aired as a special on ABC last year. Toy Story That Time Forgot reunites Woody (Tom Hanks), Buzz Lightyear (Tim Allen), Jessie (Joan Cusack), Trixie (Kristen Schaal), and Rex (Wallace Shawn) for an adventure during Christmas time. Bonnie (Emily Hahn) has opened all her presents but still chooses to play with her older toys with Woody and Buzz while giving some a fun holiday overhaul. Bonnie takes her toys over to her friend Mason’s (R.C. Cope) house to play but this year Mason has gotten so many toys it’s like he cashed in. Mason got the full Battlesaurs line including action figures, playsets, and more but he also got a brand new video game set with a virtual reality headset. Mason is addicted to the game and Bonnie throws her old toys to the side to check it out. In the meantime the guys encounter the Battlesaurs, and meet their leader Reptillus Maximus (Kevin McKidd). He starts getting the gang ready for battle and while our heroes think it’s all fun and games, turns out the Battlesaurs mean business including a fight to the death! The toys have to survive and must convince Maximus that he’s only a toy, not helping matters is Cleric (Steve Purcell) who is feeding into Maximus’ delusions of grandeur. 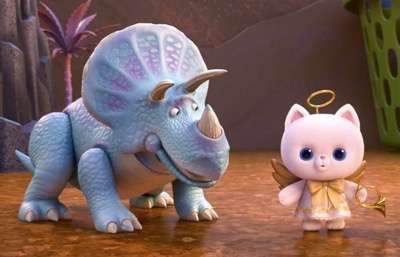 As with the Toy Story films, this story is adorable and explores familiar themes that audiences of all ages can appreciate. You can see the newly introduced toys searching for their place in the world as they struggle with identity issues and whether or not they are who they are “programmed” to be. Much like the struggle Buzz Lightyear had in the first film, it’s a great lesson for kids to not just go with what you are given but to advance and be more than the sum of your parts. This may have been a special airing on ABC but you wouldn’t know it based on the quality of animation. On Blu-ray the film sparkles and the colors are vibrant with no pixelation. You can see fine details that normally are reserved for feature film work. 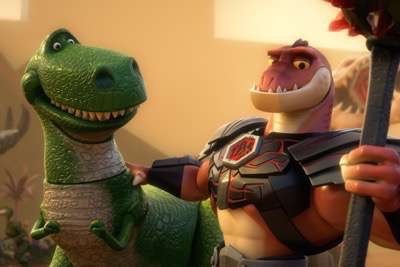 The details are especially apparent on Rex and Trixie, take a good look because this attention to detail is rare even for a feature film. It really does make the film so much better and while I didn’t see the broadcast version I can tell you that you would never get this type of clarity watching it on regular TV or Cable. There are several extras that are fun to watch especially with a younger audience. 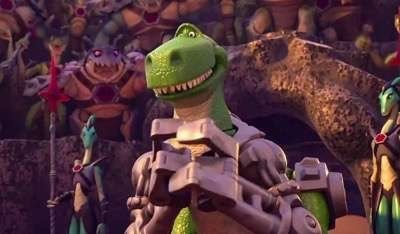 There are several featurettes including: Reptillus: which goes into detail on how they build the newer characters backstory, Toy Story Goes to Comic Con: features the cast, at… well comic con and sharing their adventures there. There is also a Karaoke sing along, deleted scenes, a special opening to the Battlesaurs, TV show, an audio commentary with director Steve Purcell and previews for other Disney films. Overall, I really loved this film, and I think kids will really enjoy seeing the further adventures of the Toy Story gang. It’s such a treat to see such care and love put into a television special and it’s a prefect release for the holiday season. Toy Story That Time Forgot is out now on Blu-ray!